Carefully cut the pumpkin in half, vertically. With a spoon, remove the seeds and threads. Cut the pumpkin into 3-4 inch pieces. Prepare the syrup, heating the cup of water, piloncillo, cinnamon and salt in a large pot over low heat. Cover and let cook, stirring occasionally, until the piloncillo has dissolved completely. Add the pieces of pumpkin, skin-side down, to the syrup. Cover and continue cooking over low heat for 30-45 minutes, occasionally coating the pieces with the syrup, until the pumpkin is completely cooked. Let cool slightly. Arrange 2-3 pieces of pumpkin on a plate, per serving, and coat with the remaining syrup. Serve and enjoy! If you have any leftover pumpkin, prepare pumpkin empanadas, bread or hotcakes. Pumpkins are synonymous with fall, both in terms of autumn decorating and as a main ingredient in a number of dishes and seasonal desserts. In Mexico, the most popular dish that incorporates pumpkin is a traditional dulce known as calabaza en tacha: soft pieces of pumpkin coated in a kind of brown sugar and cinnamon syrup. 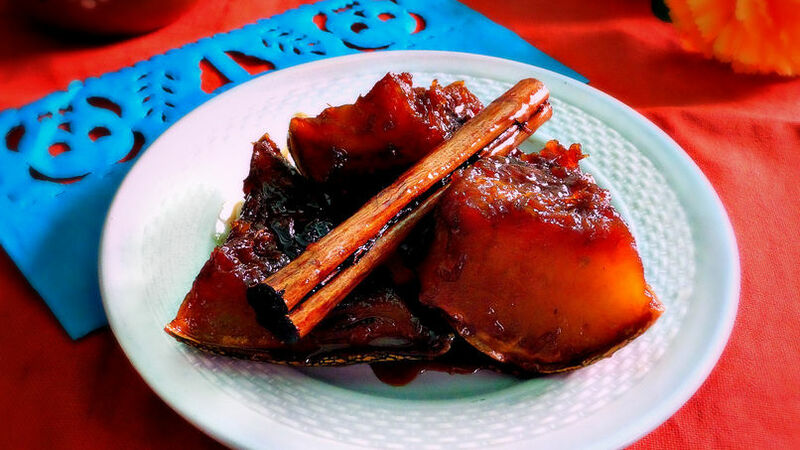 Traditionally, candied pumpkin is prepared in large quantities in clay pots for special occasions such as the posadas navideñas and for the celebration of the Día de los Muertos. With this super easy recipe you can now prepare calabaza en tacha at home so your entire family can enjoy this delicacy of Mexican cuisine.